"I've got a beautiful feeling/Everything's going my way." The first of the Rodgers & Hammerstein operettas, Oklahoma! is also one of their best. There's one great song after another, broad slapstick, wry and black humor, and plenty of dancing. The plot is a little thin, but since when was plot very vital to a musical? Curley (Macrae), a cowboy in Oklahoma Territory, is in love with Laurie (Shirley Jones in her film debut), a farm girl, at the turn of the century. Relations between the cowboys and the farmers were strained at best, as is made clear in the course of this film. The action centers around a "box social" at a nearby ranch. Curley is embarrassed to ask Laurie to the box social, and she consents to go with the hired hand, Jud Fry (Rod Steiger at his most threatening), just to spite him. However, Jud has a bad temper—today, he'd probably be called a "stalker." He also has been in love with Laurie for some time and is determined that no one else will have her—even if he has to kill her to make sure of it. Under Fred Zinnemann's direction, the cast puts in a highly energetic performance throughout. The dance sequences, choreographed by Agnes de Mille, are also energetic, although the central dream ballet seems to go on forever; one really needs the intermission when that's over. Although it's important to the film dramatically, it should have been cut significantly because it really drags the picture down for a while. The music is well performed throughout, although running the subtitles in tandem with the film will increase your enjoyment of the wit in the lyrics. Particularly noteworthy is the humorous Poor Jud is Daid, where Curley suggests to Jud what his funeral might be like, if he were to die. "He looks like he's asleep/it's a shame that he won't keep/But it's summer, and we're runnin' out of ice." Other classics include Oh What a Beautiful Mornin', People Will Say We're in Love, I'm Just a Girl Who Cain't Say No and Things are Up to Date in Kansas City. There are many more that you're guaranteed to be humming afterwards. One of the very best movie musicals. Image Transfer Review: Unfortunately, this disc was made before Fox saw the light about anamorphic enhancement. That is truly tragic because this film with its vivid colors and elaborately choreographed movement cries out for an anamorphic picture. Only a 4 Mbps video bitrate is used, which is pathetically low for a film of this type. There are other problems with this transfer. While the colors are all bright, the reds appear oversaturated, badly at times. The titles in particular are oversaturated; between the hot red and yellow, the ornate typeface used and the scan lines, the titles are all but unreadable. While the blacks tend to be good, shadow detail is almost entirely lacking. The backgrounds in a number of scenes flicker badly, to the point of being highly distracting. Notable instances include the songs Many a New Day and The Farmer and the Cowman, There is also significant moire and shimmering visible in the picture. A few instances of frame damage are also visible. Audio Transfer Review: The sound is quite satisfactory. It is not terribly directional, and the vocals tend to be centered, with orchestral parts being sent to the mains and surrounds. There is not much in the way of bass response to be heard. At times, there is significant hiss. The ensemble work in a number of songs sounds clearly looped, since the clarity of DVD allows us to hear that the background sound of various voices is different as they come and go. This could have been done much better with a little attention. Extras Review: The primary extra is a theatrical trailer. The trailer is anamorphic, but it is shown full-screen, giving the picture a ridiculous stretched-out appearance. The chaptering is adequate for finding any favorite songs, and the subtitling is useful. There are several-screen bios for most of the notable players, Rodgers & Hammerstein and Zinnemann. The disc gives us the overture, intermission entr'acte and exit music for the film. The presentation of this great musical in such shabby shape is truly tragic. 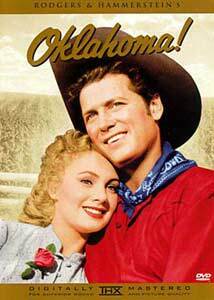 I can only hope that Fox, with its recent change of heart, will revisit Oklahoma! in the not-too-distant future in a fully restored special edition. This disc will do for now, but you'll want to replace it.